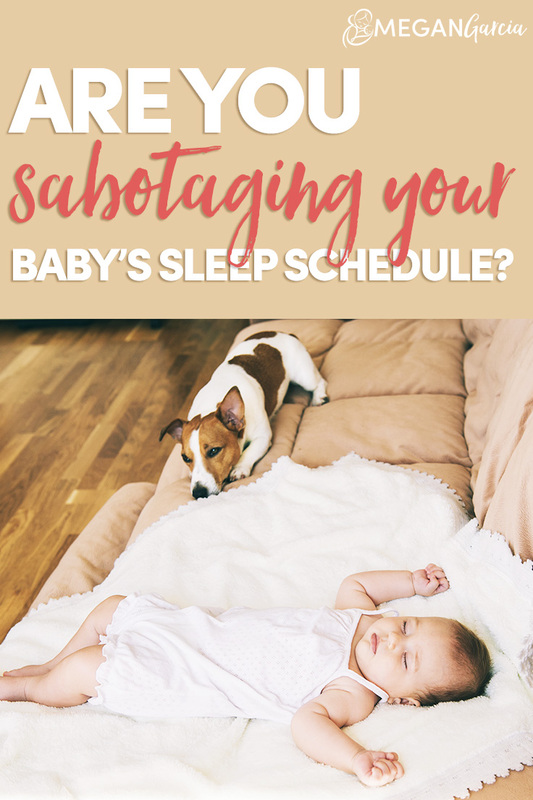 Are You Sabotaging Your Baby’s Sleep Schedule? If your baby’s sleep schedule is nonexistent, you might wonder what you’re doing wrong or look for ways to get your baby to “sleep through the night.” But as with food, your baby has radically different needs than an adult. The sooner you accept those differences, the easier it is cope with a baby who wakes during the night. Sort of like riding the wave — instead of fighting it. As far as a “normal” and a healthy sleep schedule, it’s not clear whether one exists. According to a 2010 article published in Pediatrics, more than 50% of babies sleep through the night by the time they reach 5 months old. That leaves roughly 50% who aren’t sleeping through the night. With those stats in mind — hopefully reassuring you that things are more or less normal — here are some tips to ensure you and your baby get the best sleep possible. Before we even begin talking about your baby’s sleep schedule, let’s talk about your own. Your circadian rhythm describes how your body transitions from day to night. It turns out that signals inside the body have a cyclical nature — growing and diminishing in a 24-hour period that mostly follows the rising and setting of the sun. It’s sort of wild when you think about it. How the body is exquisitely tuned in to sunshine, moonlight, and starlight. Two hormones — vitamin D and melatonin — heavily rely on this cycle. Otherwise known as your sunshine vitamin and your sleepytime hormone, these signals are wired to changed along with the time of day. Unfortunately, folks spend so little time outdoors and so much time in front of artificial light at night, that this circadian system is often thrown completely out of balance. In adults, the effects of circadian misalignment show up as metabolic issues. Things like belly fat, painful spots of inflammation, and trouble controlling blood sugar. As far as who’s keeping time, you have a “master” circadian clock in the brain that relies on light. You also have a bunch of little “peripheral” clocks throughout your body (which includes your microbes) and these rely on other cues, such as food. Blue light from devices mimics daylight and interferes with the production of melatonin, which peaks at around 3 am. Because melatonin supports sleep, an interrupted circadian rhythm can mean a restless slumber … not to mention the other effects of a distorted circadian rhythm, like belly fat and ongoing inflammation. Ah. The little peanut that falls asleep while nursing. It’s sweet. It’s beautiful. And sorta magical. Part of that magic is your melatonin mojo. During the first few months of his life, your baby has an erratic sleeping pattern. The circadian fluctuations of melatonin (and its precursors) in breast milk help to “consolidate” your baby’s sleep schedule. And just as your melatonin peaks at around 3 am, levels in breast milk also rise. Here’s the thing though — artificial light at night may reduce the amount of melatonin in your breast milk. This isn’t just bad news for your baby’s sleep — it can also mean more nights trying to soothe a colicky baby. Because melatonin relaxes the gut and is linked to less cases of colic. By the time your baby reaches 12 weeks old, he’s producing his own melatonin. This is also when parents tend to see a more stable sleep-wake cycle and it’s when you see colic resolve on its own. 1 – Help your baby avoid screens. This may sound obvious, but here goes — near sundown and when it’s dark, avoid exposing your baby to blue light from screens. Also — babies have extra large pupils and they end up absorbing twice as much blue light as an adult. 2 – If you pump, label your milk. On Instagram I got a question about giving nighttime milk to babies first thing in the morning. I don’t know about you, but I have woken up with engorged breasts more than once and fed a hungry baby in the wee hours of the morning. While this milk is melatonin-rich, I don’t think it needs to be pumped off and reserved for the night. Mamas who pump like it’s their job will usually do at least one nighttime pump. This milk, along with your first morning milk, should have the highest levels of melatonin. Label this milk and use it for evening and early morning feedings. 3 – Use tools to minimize your exposure to blue light. Tools. As in things that transform blue light. I could tell you turn off the lights and avoid all screens after sundown — but I’m gonna be real. I usually go to bed late and screens are in the picture. Maybe you too? Apps for my screens, like f.lux or Twilight. Warm lightbulbs. Look for a temperature under 3000K, like these. 4 – Help your baby feel safe. If you cosleep with your baby, I recommend this cosleeper by Snuggle Me Organic. It’s the one I use. It safely surrounds my little babe, so that he feels supported and sleeps well. Got tips to support a healthy baby sleep schedule? I’d love to hear about them!